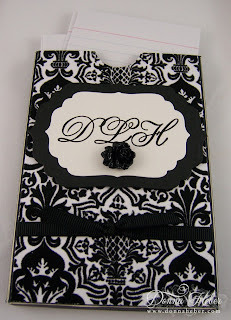 I am so excited today to show you what I created with my Notebook Pocket die. See, I never seem to have any paper when I need to jot something down (like a card recipe perhaps) so this notebook is for me. Oh, I will be making more for family and friends ... but see the initials on this one? This took no time at all to create and the possibilities are endless! I used my Big Shot and a black piece of mat board to create the notebook pocket. If you have never used mat board before it is wonderful! The pocket will hold 3” x 5” paper or index cards. Now I will let you in on a little secret ... in this world of technology you would think I would have a Blackberry or PDA, but I don’t. Actually, I had a PDA when they first came out; however, it didn’t seem to work for me. I would throw it in my pocketbook and leave it there for a week and whenever I needed to retrieve any information from it the battery would be dead. Yup, I would never remember to put it on the charger so that little piece of technology went to goodwill. I make lists all the time and never have an issue with pen and paper ... lol. I don’t know about you, but it makes me feel good to cross things off. So, I hope this will inspire you to create something wonderful even if it is for yourself! 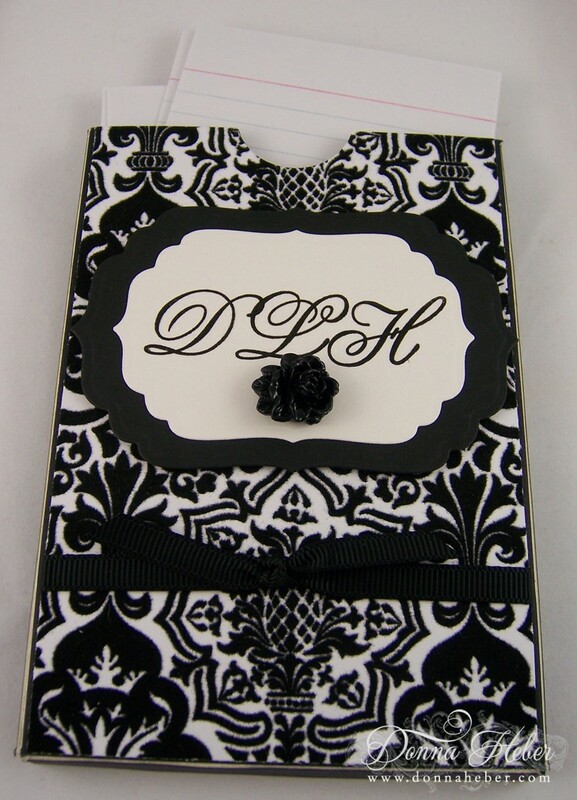 what a great idea donn and so elegant paper. Fabulous idea Donna, very elegant. I love this, Donna! Chic and classy with the black and white! I'm with you, like to write down stuff and be able to cross it off. I do enjoy the computer and iPad, but can never be without my pen and paper! Enjoy your new paper holder! Donna, this is sooo beautiful!! I love it and I actually pack a little notebook around with me because I am a big time list maker. I keep thinking I'm going to decorate it, but haven't yet. I'm a list person from way back and have a pad of paper in almost every room. The paper holder you made is very elegant looking and I love the monogram on it; your friends and family will appreciate one of these as a gift for sure. ooh, so pretty! I too love decorated notebooks and notepads. It's always more fun to write in something pretty! Great idea! I love little notepads! I am a list maker-give me pen & paper any day. There is just something very satisfying about crossing off completed tasks! 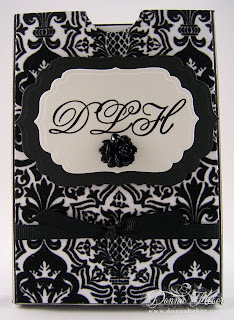 What a fun idea Donna and this one is just gorgeous. I too am a pen and paper list maker. It just works, you know? Donna, wonderful idea. I keep a small spiral notebook in my purse, but then I have to transfer the info into its final storage place. Your idea with the index cards makes a lot of sense. What an awesome idea and so elegant. What a great idea... I love making lists and crossing them off as I go. Thanks for the inspiration. Wonderful project. So elegant and lovely, yet useful; form and function equally pleasing! Gorgeous. Black and white look so cool together.